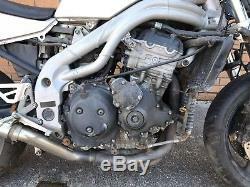 TRIUMPH DAYTONA 955i 2001 REPLACEMENT ENGINE 147 bhp. 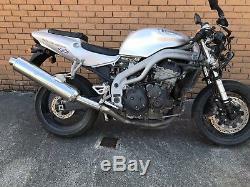 TRIUMPH DAYTONA 955i 147 bhp'2001' BROKEN ALL PARTS WILL BE LISTED ON HERE. FOR SALE - REPLACEMENT ENGINE , IT STARTS AND RUNS FINE LOW MILEAGE 36,000 MILES THAT'S LESS THAN 2,000 MILE A YEAR , WE HAVE A VIDEO OF IT RUNNING IF YOU CONTACT OUR WEBSITE WE CAN SEND IT TO YOU. ENGINE DOES'NOT' COME WITH STARTER MOTOR, ALTERNATOR, THROTTLE BODIES OR STARTER CLUTCH, THESE ARE LISTED SEPARATELY. PLEASE LOOK AT ALL THE PICTURES AS THEY MAKE UP MOST OF DESCRIPTION, IF YOU ARE UNSURE OF FITMENT PLEASE CHECK WITH DEALER. WE ALWAYS TRY AND USE PART NUMBER WHERE WE CAN. WE NOW ALSO CARRY PARTS FOR HARLEY DAVIDSON. ALL PARTS ARE NOW PREPACKED READY FOR DISPATCH SO WE ARE UNABLE TO TAKE MORE PHOTO'S, MEASURE OR SPLIT AN ITEM UP. POST CODES, NUMBERS BETWEEN AND INCLUDING HIGH to LOW. ALSO ALL NORTHERN IRELAND'BT POST CODES, ALL CHANNEL ISLAND POSTCODES, ALL ISLE OF MAN POST CODES. Country Code Low High City Origin Surcharge Destination Surcharge. United Kingdom GB AB37 AB38 Extended Area Surcharge. United Kingdom GB AB44 AB45 Extended Area Surcharge. United Kingdom GB AB53 AB56 Extended Area Surcharge. United Kingdom GB CA18 CA27 Extended Area Surcharge. United Kingdom GB HS1 HS9 Extended Area Surcharge. United Kingdom GB IM IM Extended Area Surcharge. United Kingdom GB IV14 IV28 Extended Area Surcharge. United Kingdom GB IV30 IV32 Extended Area Surcharge. United Kingdom GB IV36 IV36 Extended Area Surcharge. United Kingdom GB IV40 IV56 Extended Area Surcharge. United Kingdom GB IV7 IV7 Extended Area Surcharge. United Kingdom GB IV9 IV12 Extended Area Surcharge. United Kingdom GB KA27 KA28 Extended Area Surcharge. United Kingdom GB KW KW Extended Area Surcharge. United Kingdom GB LA15 LA23 Extended Area Surcharge. United Kingdom GB PA20 PA20 Extended Area Surcharge. United Kingdom GB PA21 PA38 Extended Area Surcharge. United Kingdom GB PA41 PA41 Extended Area Surcharge. United Kingdom GB PA42 PA49 Extended Area Surcharge. United Kingdom GB PA60 PA60 Extended Area Surcharge. United Kingdom GB PA61 PA78 Extended Area Surcharge. United Kingdom GB PA80 PA88 Extended Area Surcharge. United Kingdom GB PH17 PH26 Extended Area Surcharge. United Kingdom GB PH30 PH44 Extended Area Surcharge. United Kingdom GB PH49 PH50 Extended Area Surcharge. United Kingdom GB TR21 TR25 Extended Area Surcharge. United Kingdom GB ZE ZE Extended Area Surcharge. ONLY DAMAGED IT TRANSIT GOODS ACCEPTED. 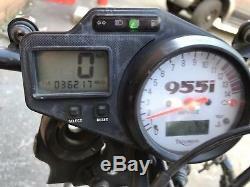 The item "TRIUMPH DAYTONA 955i ENGINE 147 bhp RUNNING LOW MILEAGE ON VIDEO NO/4682" is in sale since Saturday, November 3, 2018. 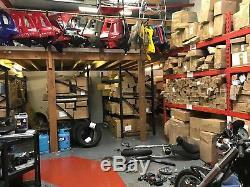 This item is in the category "Vehicle Parts & Accessories\Motorcycle Parts\Engines & Engine Parts\Complete Engines". The seller is "triumphant20years" and is located in Merthyr Tydfil.